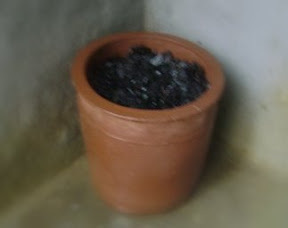 Biochar / charcoal can be used for tapping the Nitrogen and other useful elements. Simple urinals are designed http://e-biocharurinals.blogspot.com/ for tapping the nitrogen and other useful elements for using as a soil amending material for improving the quality of the soils, increasing crop production, addressing the global warming by reducing the NOx emissions, avoiding artificial fertilizers, keeping the toilets clean and odor free, etc. Two sets of prototype Urinals - PVC urinal and Clay pot urinal are designed and being used by GEO. The production of fertilizers require lots of energy, in many countries Natural gas is used for producing urea in large quantities. This demand is ever growing and we dont have enough energy to meet the demands. The complex fertilizers are also contributing to alkalinity of the soils.